The terrible shooting of children in America last week should have brought a moment of reflection between our two nations as we shared an empathy over the senselessness of violence, especially violence targeted against the most innocent. Sadly, however, the attack was quickly turned into a political talking point by claiming that American President Barack Obama doesn’t care about Pakistani children killed by drones. It’s convenient to believe that the American President is a heartless monster, but we should really consider who are the children that are killed without anyone shedding a tear. 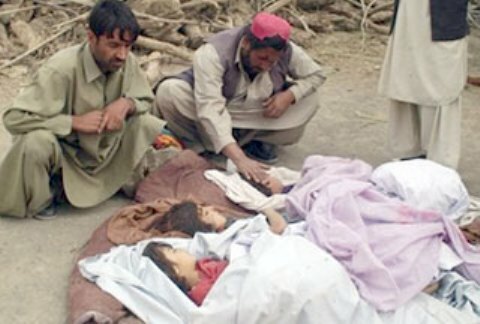 British peace activist George Monbiot claims that the American President has heartlessly murdered Pakistani children. Obviously, Mr Monbiot is trading in hyperbole in order to make his point which is that the victims of drone attacks “are just as important, just as real, just as deserving of the world’s concern” as the school children murdered in Newtown. This is a point that should be easily made without resorting to such sensationalism. According to The Bureau of Investigative Journalism, 176 children have been killed in drone strikes. This is a heartbreaking statistic by any measure. But these are not the only children who have died in Pakistan. Seven children and an adult have been killed by a roadside bomb near a Shia Muslim procession in north-western Pakistan. The attacker struck in Dera Ismail Khan, a stronghold of Sunni militant groups who see Shia as non-believers. Taliban gunmen in north-west Pakistan have attacked a school bus, killing the driver and injuring three pupils in a sectarian attack, police say. Sadly, there is no national or international investigative committee that counts these children, so no one knows the total number of innocent children murdered by sectarian killers. There are also the children who become ‘collateral damage’ in militant attacks, and the Taliban child suicide bombers of which there are believed to be hundreds brainwashed by the Taliban and used as human drones in their ongoing war. And how many countless children will suffer and die as a result of militants murdering polio workers? Malala Yousafzai gained international attention after being targeted by Taliban. But there are thousands of children whose names nobody reports, whose numbers no media group counts, whose deaths their families are abandoned to cry over alone. These are our own children. Are they not worth our own tears and our own outrage just because they were not fortunate enough to die in a drone strike? Former Ambassador to the US Maleeha Lodhi expressed this victim mentality perfectly when she wrote earlier this week that “the tyranny of geography has imposed heavy burdens on Pakistan and its people”. Blaming the American President or “the tyranny of geography” (whatever that is supposed to mean) is a simple-minded and convenient way to ignore our own responsibility for the countless children before our very eyes. As long as we tell ourselves that all of our problems are imposed on us by others and take no responsibility for our own actions, however, how can we ever hope to ease our heavy burdens? This entry was posted in Blogs and tagged drones, George Monbiot, Maleeha Lodhi, militants, sectarianism, taliban by Mahmood Adeel. Bookmark the permalink.